Providing resources to improve literacy is what the club’s dictionary project aims to accomplish. Educators view third grade as the dividing line between learning to read and reading to learn, so our club provides dictionaries each year to children in the third grade. 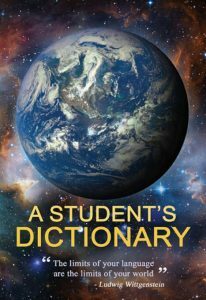 The dictionaries are a gift to each student to use at school and at home for years to come. The goal is to assist students in becoming good writers, active readers, creative thinkers and resourceful learners by providing them with their own personal dictionary. The club began the Dictionary Project in 2007. 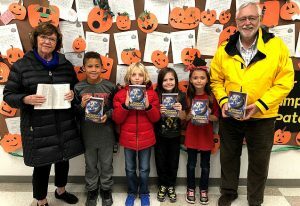 Since there is not a Rotary Club in Perry County and the need is great in the southeastern part of the state, the club has been providing dictionaries to third graders in five area school districts: Crooksville, New Lexington, Somerset, Thornville and Southern Local (Millcreek). The project involves purchasing the books, getting them ready with special stickers and then boxing them to take to the schools and presenting them to students. Club members have delivered 3,624 dictionaries since the project began. In addition, club members assist the Columbus Rotary Club in delivering approximately 700 dictionaries each year to third graders in the city’s north-area schools. Columbus Rotarians appreciate our club’s help, and our members enjoy supporting the efforts of another Rotary Club. 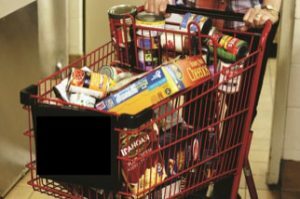 Our club supports the Worthington Resource Pantry in a variety of ways, including the collection of food and personal hygiene items, clothing drives, financial contributions and volunteers to support operations and special projects at the pantry. The club assists the Family Mentor Foundation, which connects community resources and children who need them most. 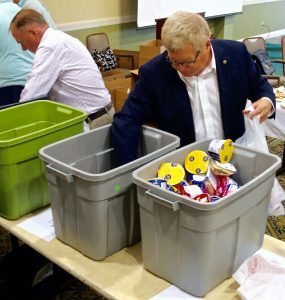 The club purchases and members assemble “Buddy Bags/Boxes,” disposable containers filled with kid-friendly, nutritious, nonperishable, individual sized-food items that are easy for children to eat or prepare on their own. These meals and snacks help sustain children, who qualify for free or reduced-fee lunch at their schools in Worthington and neighboring districts, on the weekends and during the summer when they are not in school. While many of the club’s service projects involve numerous members or a team of members working together, others are done on an individual basis. Serving as a helper at Worthington’s Northwest Library’s Homework Help Center is one of these individual service opportunities. Our Rotary helpers volunteer for several hours after school, working with students individually or in small groups on similar school subjects. The volunteers work primarily with elementary and middle school students, and a library staff member is also on hand to assist the helper and students. The Rotary volunteers assist students in understanding what their teachers are asking, show them where to find resources to help and guide them to find the answers on their own. They not only help the students will their homework, but at the same time they build relationships with them. While focusing on homework, volunteers know it’s definitely important to make the connections beyond homework. The Rotary Homework helpers are boosting the confidence of the students in academics, but also in their personal lives. Club members provide gifts for families with limited financial resources during the December holidays and distribute gifts donated by students at Worthington Kilbourne High School to additional families in financial need. In 2017, 26 families from the high school with 51 children received gifts with an approximate value of $6,000. Rotary International President Ian H.S. 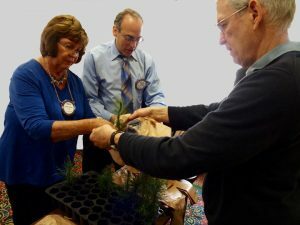 Riseley issued a challenge in 2017 asking Rotarians to plant 1.2 million trees – one for every Rotarian in the world – between July 1, 2017, and the end of April 2018. Planting trees relates to Rotary’s focus on community development, promotion of peaceful environments and the prevention of disease because trees help create a healthier environment. 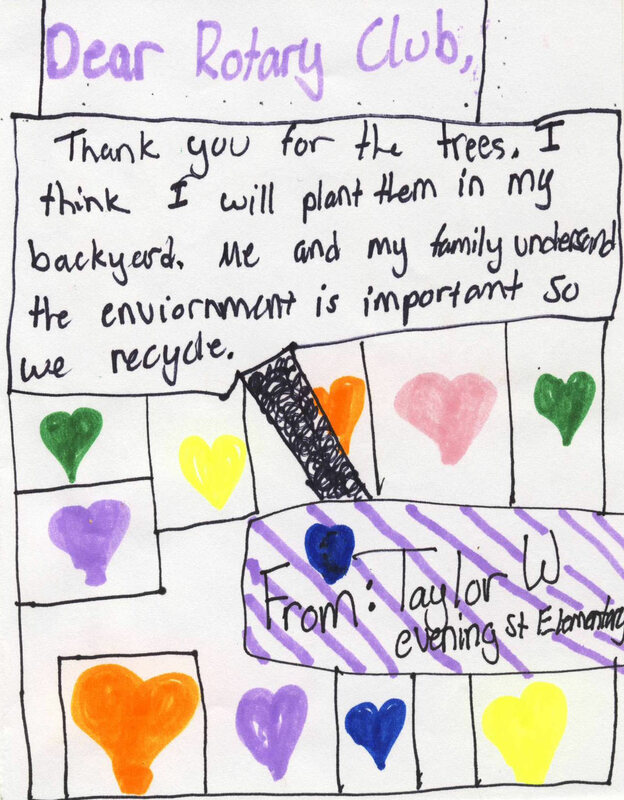 In celebration of Arbor Day our club provided scotch pine, rooted-tree seedlings to fifth graders at Dublin’s Chapman and Olde Sawmill elementary schools and Evening Street and Granby elementary schools in the Worthington School District. Club members bagged and attached planting instructions on approximately 400 seedlings that were one- to two-years old and then delivered them to the schools. Shirley Lambert and Jerry Katz have been delivering dictionaries to third graders at two schools in Perry County schools for more than 10 years, and each year they look forward to their annual visits. That’s because they know how much the students appreciate having a dictionary of their own. For many of the students in this part of the state, where as many as 20 percent of the residents are at or below the national poverty level, receiving a dictionary as a gift is a very significant event. grader. Their mother reads to them from the dictionary because there are no other books. Teachers at the schools where they visit also tell them how much it means for their students to get dictionaries of their own from their initial excitement to actually using the dictionaries in class and at home. With dictionaries in their own hands, they can look up words, find the definitions and learn so much more about their spelling, grammar and writing. The students also like the fun facts in the back of the dictionary, such as information about state flags and American presidents. For Shirley, who grew up in Perry County and chaired the club’s literacy committee for many years, it’s rewarding to return to the area and have such a positive impact on young people. “It warms your heart to see how excited and appreciative these students are to have a book of their own and to know that we, as Rotarians, are having a meaningful impact on their lives and their future,” she says. 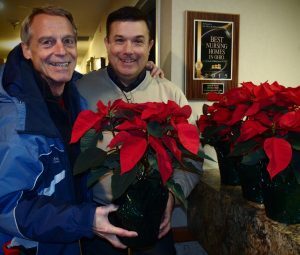 Club members provide poinsettias for residents of area nursing homes who may not have loved ones living in central Ohio. The plants are our way of bringing these individuals a little cheer during the holiday season.